In my first month back in Australia I went out to Rhodes too many times. Buy stuff at Ikea. Buy stuff we didn’t have time for the first time. And the bring stuff back that needed replacing (though their replacing damaged good policy is quite good). Rhodes looks like Mirvac is terraforming it into a new upmarket business and residential suburb. Though at the moment, as you can see from all the blue handled shopping trolleys, the major draw card to the suburb appears to be Ikea. Maybe there is more to Rhodes, being just off the Paramatta River, but it doesn’t look that interesting walking between the shopping centre and the station. 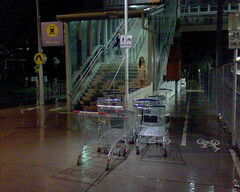 This entry was posted in Photos and tagged Ikea, Rhodes, shopping trolley. Bookmark the permalink.